The Reserve Bank of India cut its benchmark money rate for the second straight meeting. Das has brought with him a new policy framework for the central bank, which was really the point. Germany's five biggest economic think tanks now combined see only 0.8% growth this year, half of what they thought just months ago. Shaktikanta Das, a career bureaucrat with lengthy connections to Prime Minister Modi's government, was appointed as the new leader for RBI to replace Mr. Patel. Das has brought with him a new policy framework for the central bank, which was really the point. [The] domestic economy is facing headwinds, especially on the global front. The need is to strengthen domestic growth impulses by spurring private investment which has remained sluggish…since global economic activity has been losing pace. The fickle gods of "global growth." As noted a few days ago, it is a blessing than a curse. But when it's a curse it is also a convenient enough excuse to lay blame somewhere else. That somewhere else is also blaming its own somewhere else. In Germany, the country's Economy Ministry cut back growth projections for 2019. There was supposed to have been a boom this year, a real and sustained one. But as last year wore on, first it was emissions regulations and water not flowing down the Rhine which would slightly detour that boom. The Ministry said prospects "continue to be subdued in the coming months, particularly due to a lack of external demand." Germany's five biggest economic think tanks now combined see only 0.8% growth this year, half of what they thought just months ago. With the way things are going in terms of "external demand," 0.8% may yet prove very optimistic. The country's statistical agency, Statistisches Bundesamt, or Destatis, reported some very sobering accounts of Germany's factory sector. Again, whatever the unexpected slump taking place toward the end of last year, it wasn't supposed to last very long nor dig in very far. According to Destatis, however, things have already turned really bad and are only getting worse. 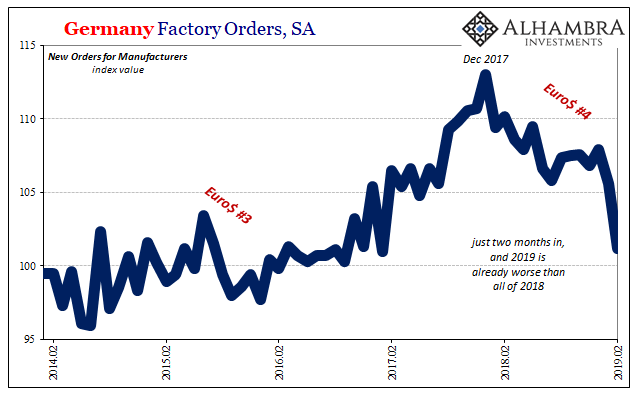 For February 2019, six months after the whole emissions excuse was first raised, orders for new product have continued to plummet. And I do mean plummet. The worst months have been, according to the latest revised estimates, the two months so far in 2019. Year-over-year, seasonally-adjusted, factory orders fell by an alarming 8.2% in February. It was the worst contraction since 2009, more than at any point during the 2012 recession. But it's not just the growth rate which should grab your attention. It is the combination of everything including just how sizeable the economic retreat has been. This is pure recession stuff, and not just recession what appears to be a pretty sharp one. 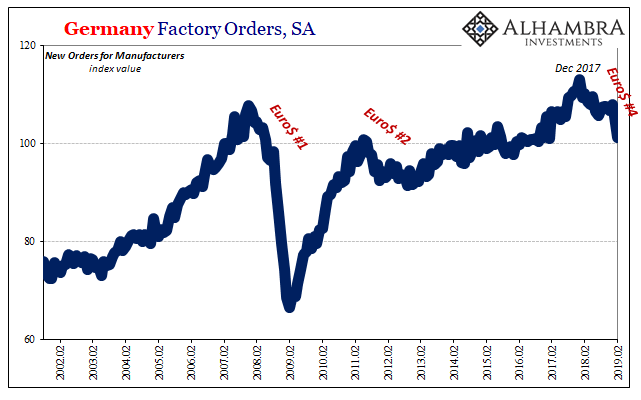 Factory orders are a forward-looking indication, too. 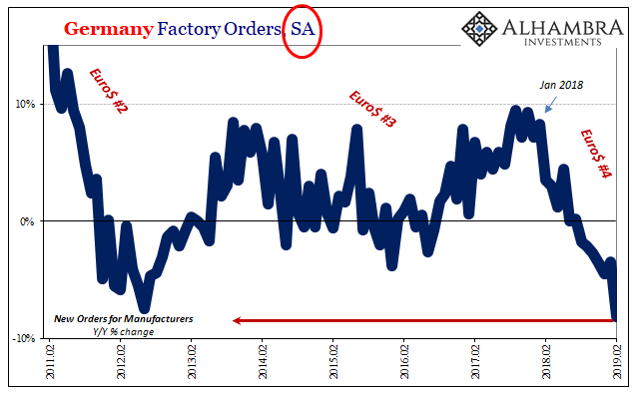 Distress in Germany's factory sector in particular if not the entire national economy is a harbinger of overall conditions for "external demand." This is a growing, meaning contraction, global problem beyond the capacities for central bankers to successfully deal with. A "dovish" slant (in Europe a third T-LTRO) is going to make up for -8.2%? They didn't know it was happening while it got worse, and if they did know they lied to everyone about it for an entire year while doing nothing. This inspires the opposite of confidence. Germany, India, China, these are not some small, out of the way nominal economies that present interesting challenges to certain unimportant global sectors. You can dismiss Argentina or the like as the natural state of the world; there's always somebody in distress somewhere. But what do you do when it's everywhere? That's kind of the point behind "external demand," global growth, or whatever you wish to call it. The ECB wants to create more useless bank reserves that already "yield" about -40 bps in official accounts or money market placements. The RBI is going to cut its benchmark rate probably again, and the Chinese will likely add more RRR cuts to the five that have already been carried out. The global economy is in trouble because that's what happens in the post-crisis era. 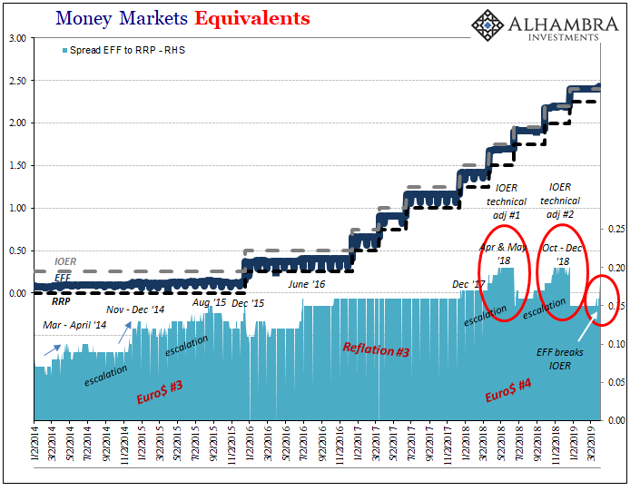 The broken monetary system means this is inevitable, the inescapable downturn just when everyone assumes there is nothing but booming conditions ahead. Once those weird market and money outliers started showing up, you knew where this was going to end up. The only thing left to figure out is how far down is down; and which places get hit the worst. In 2012, it was Europe. In 2015 and 2016, EMs. The US got out of both those with "only" a near recession each time. Does its luck run out in 2019? The real question is what this [repo/T-bill outlier] all means, up to and including whether it marks like fails in June 2014 the start of whatever the next phase of eurodollar decay might be. We obviously won't know anything like that for some time…but the biggest clue will be in escalating warnings like this. No longer just escalating, really proliferating.